The Saudi Arabian Monetary Authority (SAMA), established in 1952, is the central bank of the Kingdom of Saudi Arabia. Previously, it was known as Saudi Arabian Monetary Agency. Prior to the establishment of the Saudi Monetary Authority, the Saudi Hollandi Bank, a branch of the Netherlands Trading Society from 1926 acted as a de facto central bank. It kept the Kingdom's gold reserves and received oil revenues on behalf of the Saudi Arabian government. In 1928 it assisted in the establishment of a new Saudi silver coin, commissioned by King Abdulaziz which became the Kingdom's first independent currency. The Saudi Hollandia Bank handed over its responsibilities to the SAMA when it was established in 1952 and became a model for other foreign banks in the kingdom. Abdallah Sulaiman was a Najdi of humble background who worked his way up from clerk to the first Saudi minister of finance and close confidant of King Abdulaziz. Sulaiman surprisingly involved in probably the most significant attempt at administrative rationalization in the 1950s: the creation of the Saudi Arabian Monetary Authority (SAMA); it was known as Saudi Arabian Monetary Agency. In the early 1950s monetary chaos reigned in Saudi Arabia. Interested in at least minimal economic stability, the U.S. embassy and Aramco successfully lobbied the king to accept U.S. consultants into the kingdom. U.S. adviser Arthur Young managed to convince Sulaiman and the king of the need for basic monetary and banking regulation. Young was mandated by the king to draw up a charter for what was to become SAMA within a few hours. SAMA derived its income by charging the government for its services. Its first head was also an American, and accountants were hired from Lebanon. King Abdulaziz and Sulaiman had been convinced of the existential need for institution building in this strategic sector. SAMA’s charter and use of expatriate technocrats bolstered the relative independence of the body. After the Ministry of Finance temporarily sidelined SAMA, in 1957 the governorship was taken over by another expatriate, Pakistani Anwar Ali, who had come to the country with an International Monetary Fund mission and who held the post as a confidant of King Faisal until his death, in 1974. Different from other "fiefdom ministries," SAMA’s well-paid leadership used relative autonomy and Abdulaziz’s and Faisal’s clear reform mandates to become one of the best central banks in the Middle East. At the time of its establishment, Saudi Arabia did not have a monetary system of its own. Foreign currencies were used as a medium of exchange, along with Saudi silver coins. Saudi bank notes had not yet been issued. Banking was conducted by foreign bank branches. Therefore, the first task of the SAMA was to develop a Saudi currency. The SAMA also paid attention to the need for promoting the growth of a national banking system. In March 1961, Saudi Arabia converted to the Saudi Riyal, in accordance with Article VIII of the Articles of Agreements of the International Monetary Fund. In the 1970s and early 1980s, the SAMA focused on controlling inflation as the economy boomed, expanding the banking system, and managing foreign exchange reserves. From mid-1980s, SAMA’s priorities have been to introduce financial market reforms. SAMA is the Central Bank of Saudi Arabia, the functions of the SAMA include issuing the national currency, the Saudi Riyal, supervising commercial banks, managing foreign exchange reserves, promoting price and exchange rate stability, and ensuring the growth and soundness of the financial system, operating a number of cross-bank electronic financial systems such as MADA (previously SPAN), SARIE, and SADAD. A board of directors oversees the operations of SAMA. This comprises the governor, vice-governor and three other nominated members from the private sector. The terms of appointment are 4 years for the governor and vice-governor, extendable by Royal decree, and 5 years for the other members, also extendable by Royal decree. Members of the board cannot be removed except by Royal decree. The SAMA senior management comprises the governor, the vice-governor and five deputy governors. 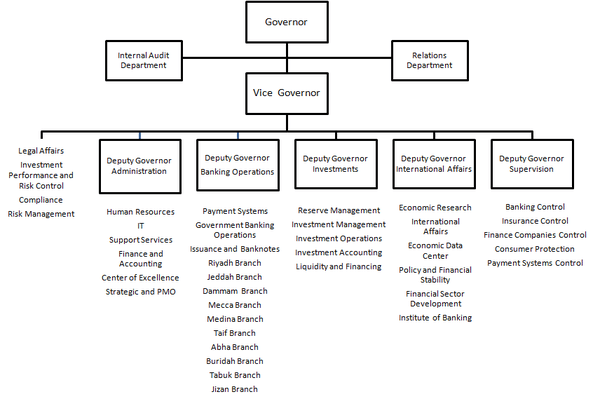 Organisational structure of SAMA as at May 2013. The SAMA balance sheet is denominated in Saudi Riyals, which is pegged at an official rate of 3.75 against the US dollar. All currency notes issued by SAMA are fully backed by equivalent gold deposits. 2012 figures are at end of 1st quarter. In addition to acting as the central bank of Saudi Arabia, the Saudi Arabian Monetary Authority controls SAMA Foreign Holdings, the sovereign wealth fund of Saudi Arabia. The fund is the third largest sovereign wealth fund in the world, with assets of over $700 billion. In October 2015, Governor Fahad Abdullah Al-Mubarak of the Saudi Arabian Monetary Authority was ranked #2 on the Public Investor 100. 1 2 3 "Saudi central bank announces change in name". Arab News. 4 December 2016. Retrieved 4 December 2016. ↑ "Saudi Hollandi Bank History". Saudi Hollandi Bank. Retrieved 26 May 2013. ↑ Albert Habib Hourani; Philip Shukry Khoury; Mary Christina Wilson (1993). The Modern Middle East: A Reader. University of California Press. p. 587. ISBN 978-0-520-08241-0. ↑ "SHB Overview". Saudi Hollandia Bank. 1 2 Hertog, Steffen (2007). "Shaping the Saudi state". Int. J. Middle East Stud. 39: 539–563. doi:10.1017/S0020743807071073. ↑ "Telegram From the Embassy in Saudi Arabia to the Department of State" (PDF). US State Department. 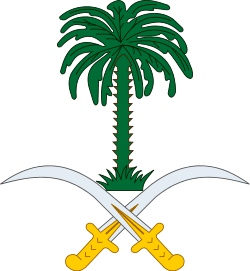 Jeddah. 3 December 1969. Retrieved 11 August 2013. ↑ "SAMA Management". Saudi Arabian Monetary Agency. Retrieved 26 May 2013. ↑ "SWFI Fund Rankings". Sovereign Wealth Fund Institute. Retrieved 4 Sep 2014. ↑ "Fahad Abdullah Al-Mubarak - Public Investor 100". Sovereign Wealth Fund Institute. Retrieved 25 October 2015.